Thirty-fourth Ottoman sultan; born Sept. 22, 1842; succeeded his brother, Murad V., Aug. 31, 1876. The Turkish Jews rightly regard his reign as the inauguration and guaranty of their prosperous condition in the Turkish empire. Abd-ul-Ḥamid always showed the greatest solicitude for their welfare; and he was the first Turkish sovereign to grant them equality before the law with their Mohammedan fellow citizens. 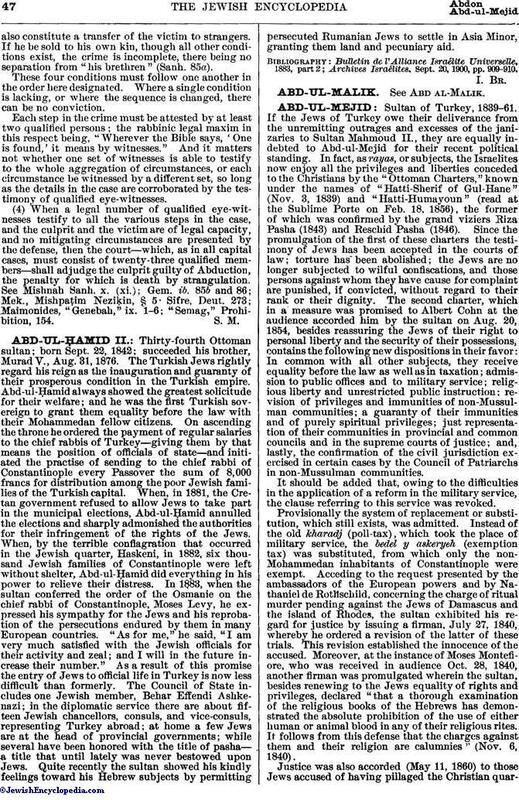 On ascending the throne he ordered the payment of regular salaries to the chief rabbis of Turkey—giving them by that means the position of officials of state—and initiated the practise of sending to the chief rabbi of Constantinople every Passover the sum of 8,000 francs for distribution among the poor Jewish families of the Turkish capital. When, in 1881, the Cretan government refused to allow Jews to take part in the municipal elections, Abd-ul-Ḥamid annulled the elections and sharply admonished the authorities for their infringement of the rights of the Jews. When, by the terrible conflagration that occurred in the Jewish quarter, Haskeni, in 1882, six thousand Jewish families of Constantinople were left without shelter, Abd-ul-Ḥamid did everything in his power to relieve their distress. In 1883, when the sultan conferred the order of the Osmanie on the chief rabbi of Constantinople, Moses Levy, he expressed his sympathy for the Jews and his reprobation of the persecutions endured by them in many European countries. "As for me," he said, "I am very much satisfied with the Jewish officials for their activity and zeal; and I will in the future increase their number." As a result of this promise the entry of Jews to official life in Turkey is now less difficult than formerly. The Council of State includes one Jewish member, Behar Effendi Ashkenazi; in the diplomatic service there are about fifteen Jewish chancellors, consuls, and vice-consuls, representing Turkey abroad; at home a few Jews are at the head of provincial governments; while several have been honored with the title of pasha—a title that until lately was never bestowed upon Jews. Quite recently the sultan showed his kindly feelings toward his Hebrew subjects by permitting persecuted Rumanian Jews to settle in Asia Minor, granting them land and pecuniary aid. Archives Israélites, Sept. 20, 1900, pp. 909-910.